Teachers and other educators are constantly required to work with an enormous amount of paper, files, notes, and digital media. They’re also tasked with managing an abundance of data for their students. Organizing this information can become more and more challenging and unwieldy. A solution for this problem is going paperless. This solution reduces the cost of paper production, reduces the negative impact of paper use to the environment, and it also increases the efficiency of educators. When talking to teachers, it’s interesting to understand how they organize their data. It ranges from paper filing systems to full-blown digital solutions. But nearly all educators agree that they’re looking for the best solution to help them get organized and stay that way. This post is intended to give teachers, tutors, homeschool parents, and other educators tips and tricks for getting their information organized and easily accessible. Tools that educators can use to get this information in a digital format and organized into a central location include Dropbox, Google Drive/Docs, Evernote, and LifeTopix. Keep reading to learn how to leverage the power of these tools. Evernote, Dropbox, and Google Drive/Docs are all great tools for storing and accessing documents in many types of formats. All of these tools can store documents, photos, and other files “in the cloud” and allow access from a personal computer or mobile device. 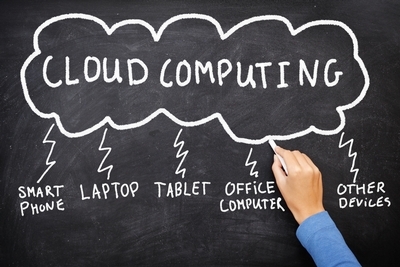 When data is stored in the cloud, it means that it’s managed and backed up remotely and made available over the Internet, instead of locally on a computer. The advantage of storing files in the cloud is there’s no worries about hard drive crashes, computer theft, or migrating data to new computers. However, these tools are not exactly the same, and this post will help you understand what makes each one appropriate for different types of uses. 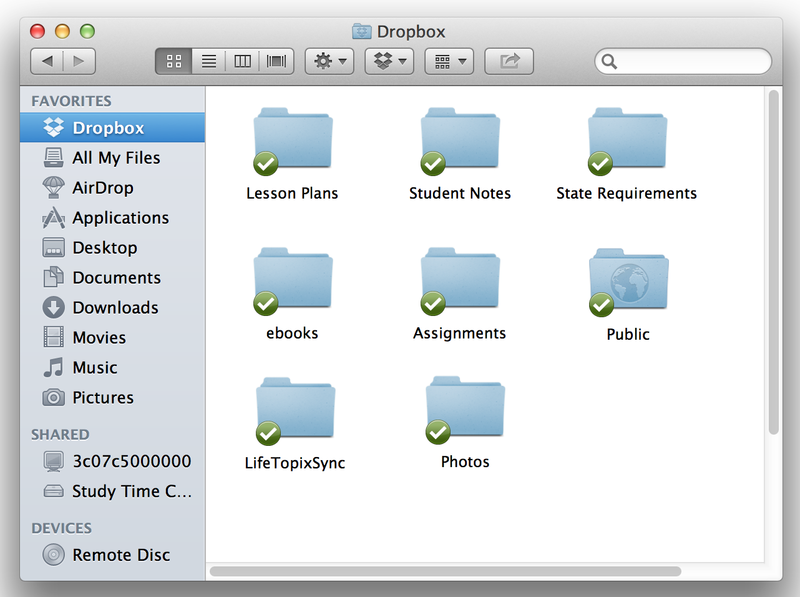 Dropbox is really handy software for storing and retrieving large files such as textbooks. Files can be private or shared with invited users. Dropbox is free up to a designated amount of storage, and provides software for personal computers and mobile devices. The file structure works seamlessly with OS X and Windows operating systems as shown in the following screenshot. 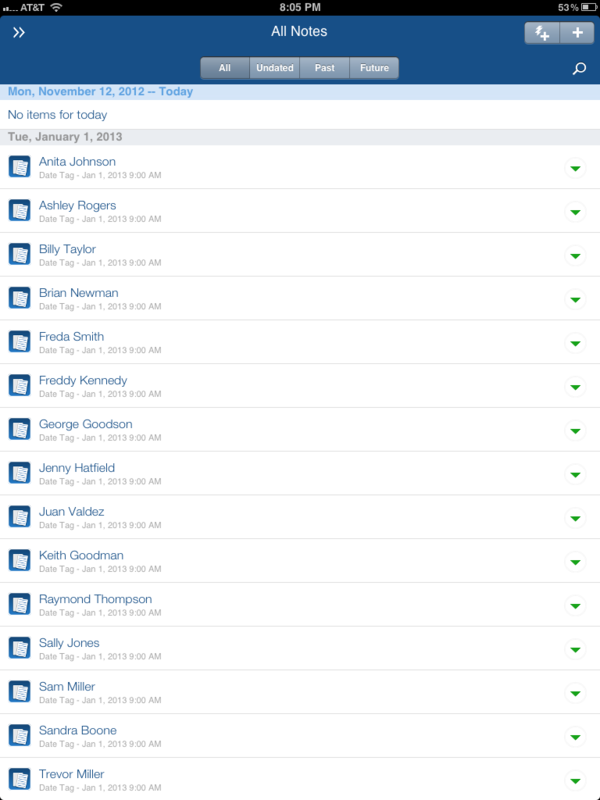 The Dropbox app is available on the iPhone or iPad, which allows complete mobility, such as moving around the classroom while accessing students’ files. There’s also the capability to connect an iPad to a television or projector to share any files with a class or student. Take note that Dropbox allows file sharing; however, it does not allow simultaneous file editing with others (Google Docs/Drive offers this functionality). With Dropbox, the servers first sync the file to their web servers, and then they’re synced to all computers that are connected via shared folders. Evernote is considered best-in-class for note taking, but it provides more than just creation of online notes, which makes it suitable for a variety of scenarios. 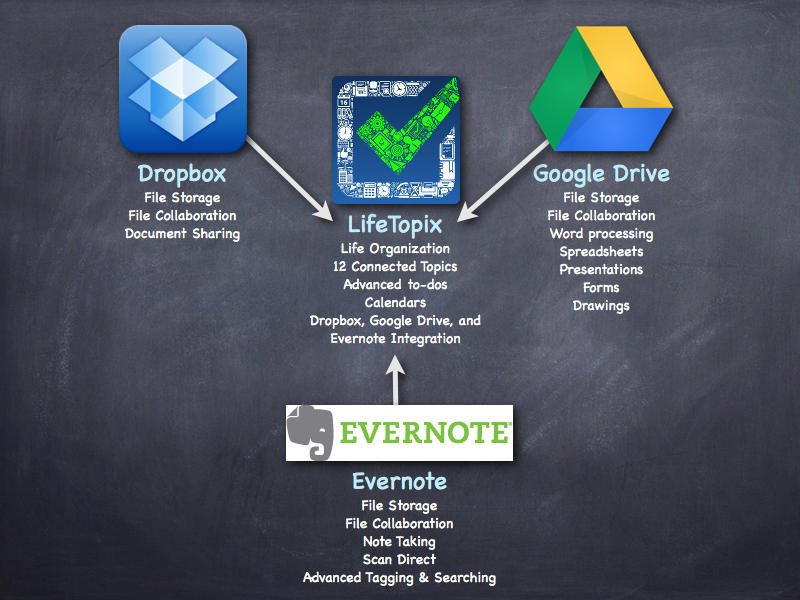 Think of Evernote as a digital filing system. Educators and students are always creating content — whether it’s tests, report cards, typed notes, audio files, images, or projects. Educators need a way to organize this information and to easily share it. Evernote allows note creation, and it also supports almost any type of file imaginable. It also includes advanced searching and tagging so it’s easy to quickly find files and notes. 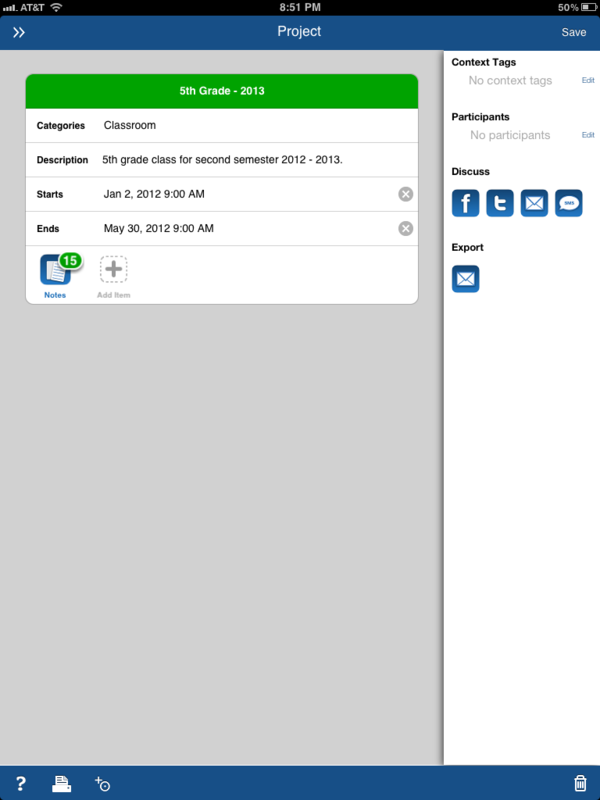 Evernote provides great information about how it can be used for schools at Evernote for Schools. It works with a variety of computers and mobile devices — there’s a free web application, desktop client, and mobile app so educators can use it anywhere. The basic service is free, and there’s options to upgrade to the Evernote Premium For Schools version. One typical scenario for the classroom would be to create an Evernote login for each student so each student would have access to their homework and projects. All their projects and homework would be included within these folders. An Evernote-compliant scanner for the classroom allows the students to store everything digitally. Imagine how this scenario would simplify parent/teacher conferences. For example, all the students’ work could be included within the student’s profile — and shared in real time with the students and their parents via computers or mobile devices. Like Dropbox and Evernote, Google Drive includes free storage in the cloud. What’s different about Google Drive is it becomes the central place for managing Google Docs. Google Docs is free web-based software for creating and updating spreadsheets, documents, presentations, and more. And with Google Docs, more than one student can edit files simultaneously, which makes collaborating on projects easy. The basic service is free, and there’s an upgrade to Google Apps for Education. Google Docs/Drive is an excellent tool for both educators and students. Educators can keep track of attendance via spreadsheets; create seating charts via presentation or drawing tools; build presentations for students, parents, and faculty; or create homework assignments that can be accessed at home or in class — the possibilities are endless. Students can collaborate easily on projects and always have access to their assignment lists and homework — which increases visibility for parents. And as iPads and other mobile devices become mainstream in the classroom, it’s important to note that Google Drive is available through the Apple App Store for iPad, iPhone, and iPod touch. An increasing number of schools have started pilot programs using the iPad, and they’re seeing great potential. As iPads and other tablets become more popular in schools, apps that bring all this information together will be of utmost importance. There’s no need to wait — educators have options now for organizing all this information into one place via their mobile devices. Imagine showing up for school without a backpack, laptop bag, heavy books, and piles of papers. With the right tools, educators and students can lighten their load significantly. From what we’ve seen over the last few years, educators are using a variety of tools for per­sonal and col­lab­o­ra­tive notes, doc­u­ments, and files. We’ve embraced the con­cept of get­ting more value from notes, files, and doc­u­ments by allow­ing these items to be used in context within LifeTopix. Hence, LifeTopix was developed to be compatible with Evernote, Dropbox, and Google Drive/Docs. It’s an extremely flexible app via its 12 connected topics, which allows educators to manage all parts of their lives — their own way. I’ll show you a few scenarios of how educators would use LifeTopix to organize their education-related data for the classroom. The following screenshots show how to create a LifeTopix project (which organizes the classroom data), and then create student profiles associated with each class through LifeTopix. In the LifeTopix Tasks + Projects topic, projects contain all of the data associated with a class as shown in the following screenshot. There’s the ability to include a description of the class, start and end dates, tasks, checklists, appointments, reminders, bookmarks, files, audio, photos, videos, notes, expenses, services, and shopping items. In the LifeTopix Notes + Files topic, there’s the capability to create an entry for each student as shown below. These notes are associated with the Project above. Once an entry for each student is created, the associated tasks, checklists, appointments, reminders, bookmarks, and files (both local and online from Dropbox, Evernote, and Google Drive/Docs) can be added. This data can be kept private or shared within one tap via email with parents and students. 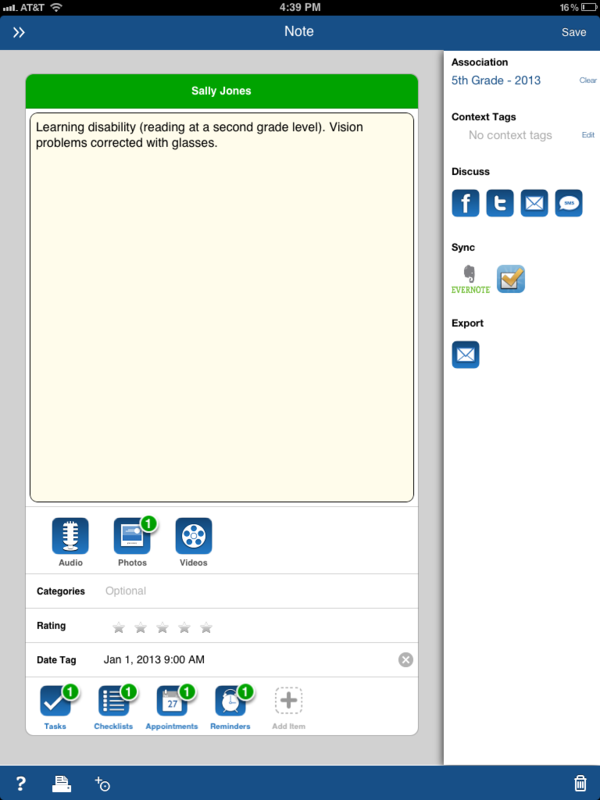 The following screenshot shows an example of a student profile. Imagine the types of items that can be associated with the students’ profile. It’s possible to set up conferences and view them on a calendar; attach a photo of the student; access online homework folders; update attendance spreadsheets in Google Docs; set reminders specific to students; and anything else that’s important for students. And for students, it’s important to note that the LifeTopix Education topic allows students to track assign­ments and related doc­u­ments and resources for school, work, or per­sonal growth sub­ject areas. And it’s inte­grated with other top­ics from LifeTopix so students can, for exam­ple, directly access local and online learn­ing resources that are defined in Life­Topix Info + Docs right from within the Life­Topix Edu­ca­tion topic. To learn more about LifeTopix for students, refer to 7 Tips to Get Organized for Back to School. We hope this helps you learn how hardware and software can help you make the move to a paperless classroom. Please comment with any questions or ideas of how you’ve gone paperless. Great article! Please keep them coming! These ideas really help me to use this app as my main GTD system.